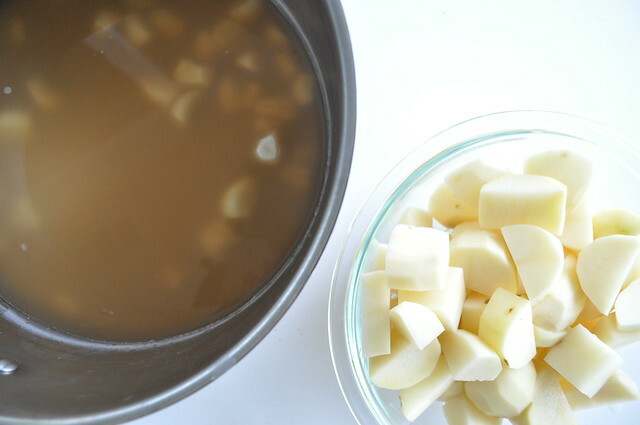 If you know how to peel potatoes and garlic, you can make this soup. And, you can make it quickly. Best part, you’ll feel fancy as soon as you garnish it and bring it to the table. Don’t be intimidated by the head count (get it? head count!!!) bahaha! OK. Regroup. 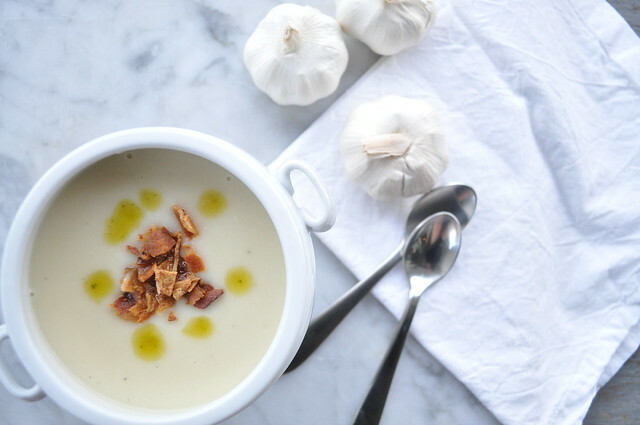 Don’t be intimidated by the amount of garlic this recipe calls for. The way you prep it keeps the subtle flavor, not the spicy, kicky part of the garlic. Peel the garlic cloves, and de-core any that have green in the middle. Place them in a stock pot, covered in water. Bring to a boil for 5 minutes. While boiling peel and chop the potatoes. 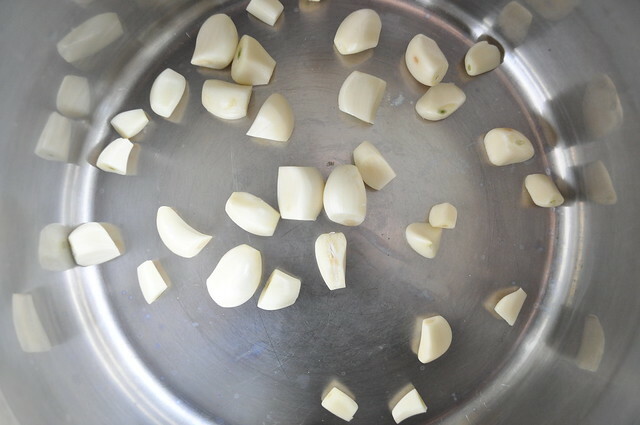 Drain water off of the garlic and discard. 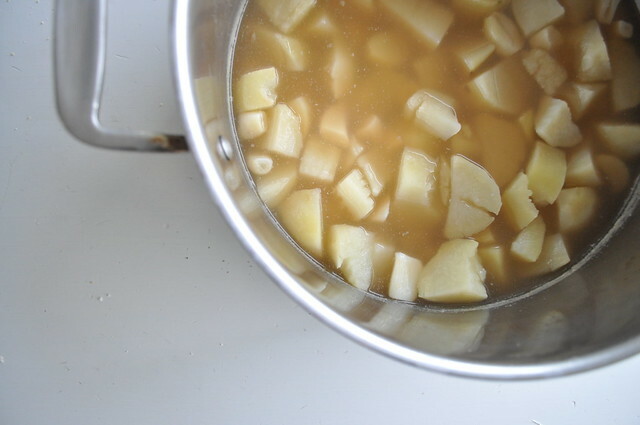 Keep garlic in the pot, add potatoes, chicken stock and additional water to cover the potatoes. Cook over medium-high heat until the potatoes are tender (approximtely 20 minutes). Puree soup then season with salt and pepper. 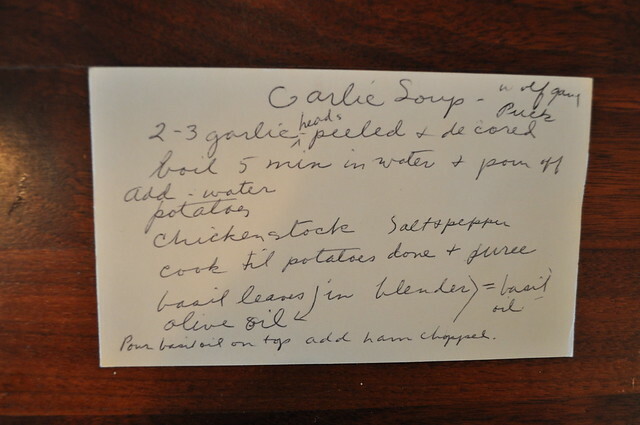 Add additional water, or chicken stock if you want your soup to be thinner. Add 1/4-1/2 cup of heavy whipping cream if you prefer a richer soup. Serve with a garnish of bacon bits, cheddar cheese, cubed ham, pesto or basil oil! I told you it will be a lot of garlic! Add chicken stock over the pre-boiled garlic and the potatoes too. Once the potatoes fall apart when mashed with a fork, they are ready to be pureed. I lost a lot of stock to evaporation so I added a splash of water and then finished the soup with cream. This is a fun soup for a party. People love being able to add their own toppings! What toppings will you go for?! Sounds so good and easy. The whipping cream and bacon bits are a must.